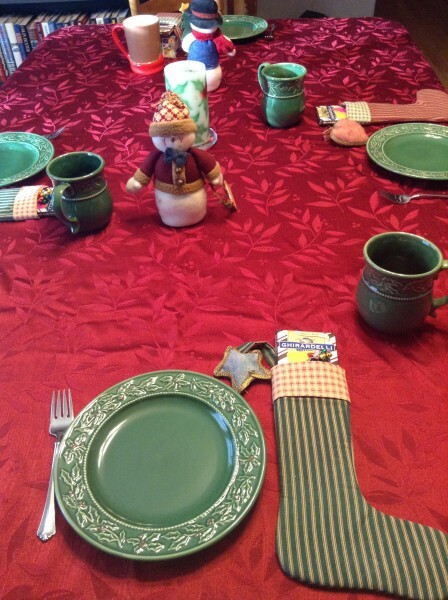 Once again, we gather around the table to celebrate the end of Christmas. 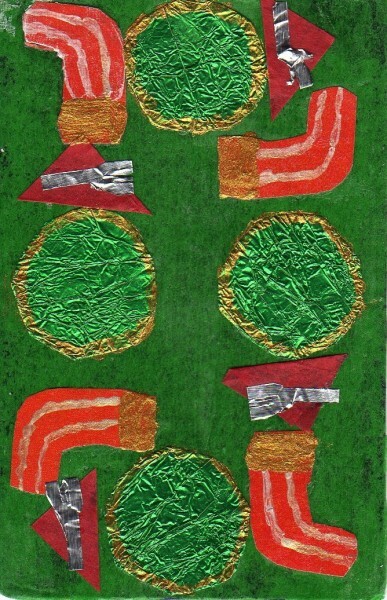 Again, this card was an experiment with different media. The table cloth and napkins are tissue paper, the forks are cut from aluminum foil. 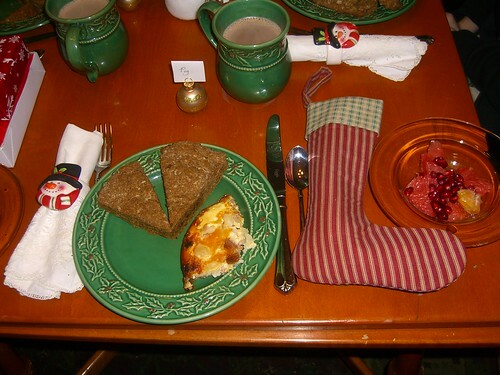 And the plates are from the foil wrapped around the Hershey's Kisses we had inside the miniature stockings. 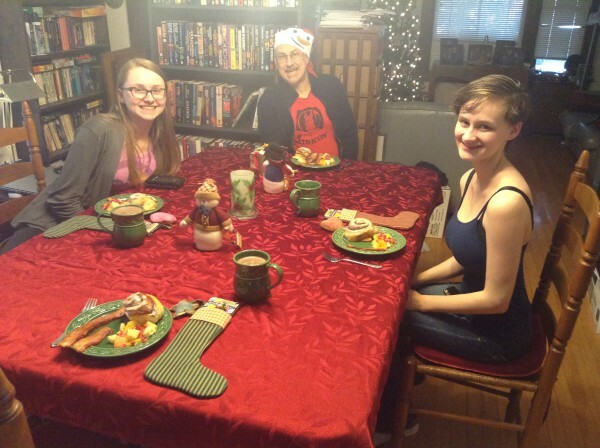 We did indeed manage to gather around the table this year, although it was a Twelfth Night dinner this time rather than breakfast. That's just the way the schedules worked out. He was the bravest man I ever knew. This was the week that Alan Rickman died, and I made this card in honor of him and in honor of one of my favorite of his performances. Once I started thinking about Severus, I started making connections between his situation and mine (and not all of them are flattering, to say the least). This gets into personal stuff, so Elinor Dashwood will leave it there for now. 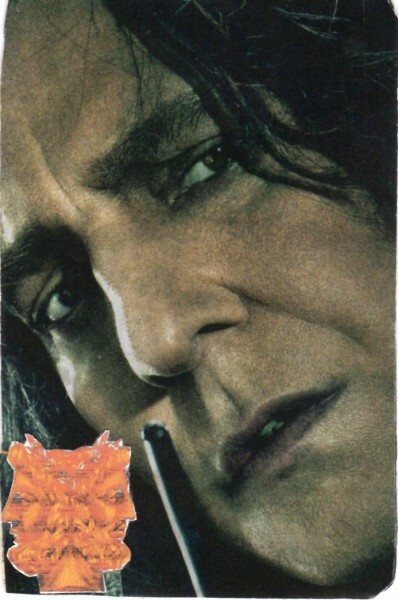 It was the last day of the previous week, January 9, that was Severus Snape's birthday. Rowling deliberately chose that day because it was the feast for the Roman God Janus, the two-headed god who guarded doorways, looking both into the past and into the future. An extremely appropriate choice for the ambiguous Severus Snape's birthday, and an appropriate thing for me to ponder, as I think about my career--where it has been as well as where it is going. 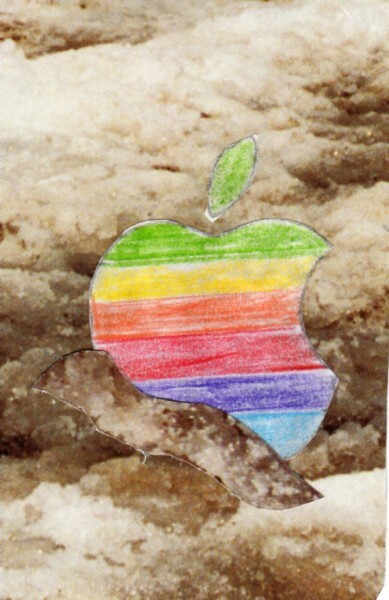 I lost my iPod in the snow and felt helpless without it. At least by process of elimination, that's where I figured it wound up. I never got it back. I held out a week, gritting my teeth, and then I bought a replacement. Screw the fact that I am unemployed. I need one to organize my life. Annoyingly, I found out when I upgraded to the next model, that I can't synch it on my iMac. The software on my desktop Apple is too old. Planned obsolescence is pretty damned annoying. There are three things I do to help myself. This was a tough week. Again, Elinor Dashwood will not provide many details. The three stones represent three stepping stones, the sort to keep you above the water you would drown in otherwise (I tried and tried to find an image of three stepping stones, but for a variety of reasons, what I found just didn't work. So I used an image of stacked stones). The stones represent three things I do throughout the week for self-care. 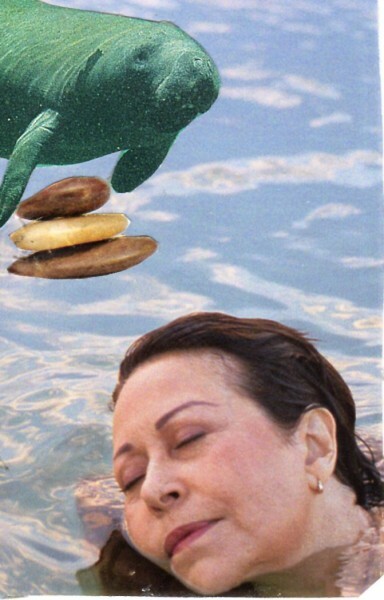 The stones are carried by a manatee, and if you haven't found the site Calming Manatee, really, what are you waiting for? I know what the next card is (Card 24) and I worked on it today, but I had tremendous trouble with figuring out the right fixative to use. I had an image with words superimposed over it. I printed the words on waxed paper, but every fixative I used just smeared or blurred the words. I have an idea for how to fix the problem, but it involves a trip to the store. So I started working on the next card (Card 25), and finished it, too. I worked on the cards OUT OF ORDER! I felt SO GUILTY! And I will not scan and show this past week's card until I finish the card for the week before. This means we are almost halfway through the year! (It also means it's been half a year since I've had a job--groan). minnehaha K. impishly suggested that we could swap decks and I would do the rest of hers and she would do the rest of mine. I firmly vetoed this idea. But then she made the clever suggestion that we would each do the jokers of the other person's deck, one at Week 26 and one at the end. Which I think is a really cool idea. Fiona has a work shift and wants to get back to her apartment, so we held our 12th night celebration today, a few days early. I spent weeks stripping and sanding that table down to the bare wood, working in the outdoor patio behind Rob's apartment (this was before we were married). It took so long because I had to dig into the crevices in the legs with the edge of a nail file to chase every last bit of brown paint out in the detailing of the lathe-turned grooves. You can still see tiny bits of the paint, like shadows, proof that I was not an expert used furniture refinisher by any means. I don't remember what the wood was, but I stained it a red maple color and covered it with a protective gloss. I remember how vexed I was by a stray hair that floated in on a breeze and caught in the gloss and affixed itself there, like an insect caught in amber. We moved it to our first apartment together, and it became our first table. 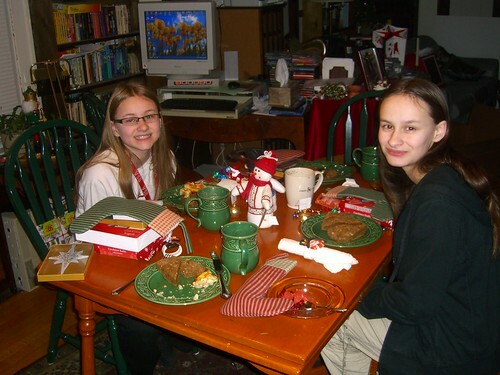 When we moved again, to our house where the girls were born, the table was put in the dining room. Rather too humble, aesthetically, for the space, but it fit perfectly, and when we covered it with a cloth, and put the best dishes on it, it suited us well. Two leaves could be pulled out from the ends to add length whenever we had guests. Over the years, of course, there were scars. Delia the toddler banged her spoon incessantly, and so there is a patina of half-moon shaped scars on her side of the table. (We always sat at the same places.) Once, someone put a candlestick on the table, and some liquid spilled and soaked the felt cushion underneath, leaving a stain which marked the varnish. There is the smear of nail polish where Delia was experimenting, and I couldn't rub it off. I didn't want to try anything stronger that would take off the finish. I'll admit I wasn't always scrupulously quick about wiping away everyday stains. It's used, battered, and hardly an heirloom. But we loved that table. We grew our family around it, and told our jokes, and traded our bon mots and cracked each other up. We had raging arguments, often about whether onions must be eaten or not. Fiona banged the back of her head against the back of her chair 1,346,234 times and never never remembered not to do it the next night. 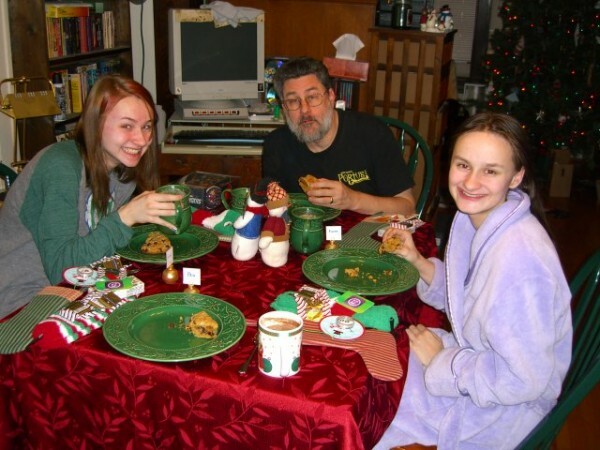 We ate our Christmas breakfasts and celebrated twelfth night there. We brought various hopeful Boys to join us. Fiona perfected her pterodactyl mating call there. We held hands around it and blessed our meals, and cried and screamed and raged and loved each other there. We didn't have a hearth, so we used a table instead. My mom is moving from the apartment she shared with Dad to a smaller senior complex. 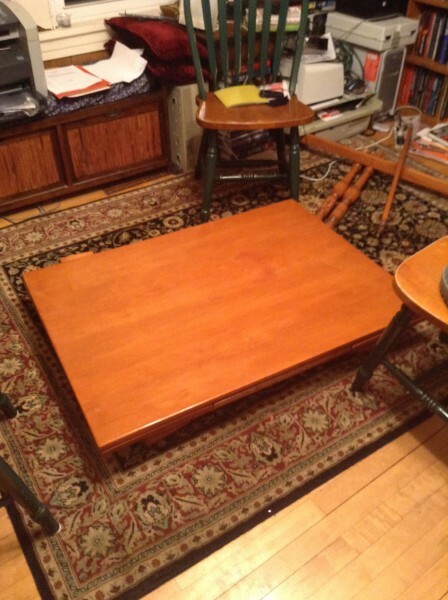 She had to downsize, and so she offered us her dining room table, the one I grew up with. It, too, has a rich family history, and many happy memories. It is bigger than ours: we will have to take leaves out and put the ends down, and we can't sit in the same configuration, because you can't put your feet under the drop leaf ends. But. 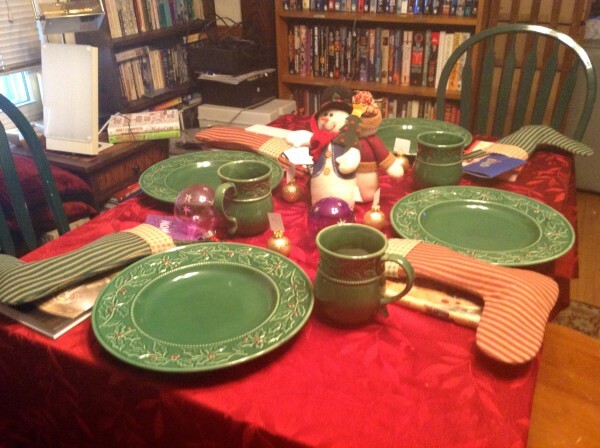 It, too, is the family table with a lot of lovely memories, and I hated to see it go to some strangers. Yes, we will take it, I said, and when the girls leave home, Rob and I can take all the leaves out, drop the sides, and it will work as a long narrow table for just the two of us. And then one of the girls can take our table when they leave to set up their own household. 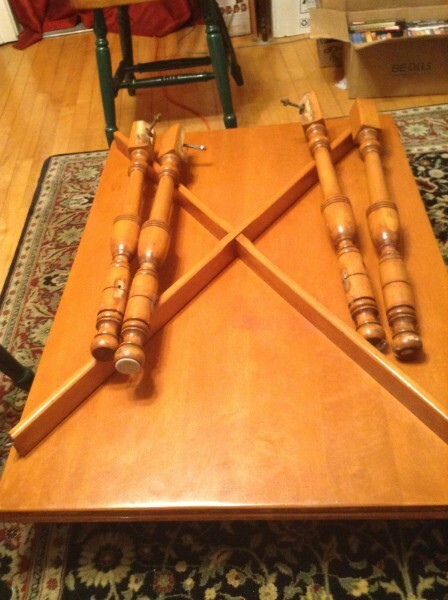 Mom is going to be using the old oak table she had in her kitchen, the one she received from her mother-in-law (yet another generation's worth of memories). and then hustle it into the basement, so the dining room is clear when the truck brings Mom's old dining room table to our house. And our old table will wait, patiently, in the basement, until either Fiona or Delia move out, painstakingly reassemble it, and gather friends and a new family around it to make a new generation of memories. I want this cake next year! Click the picture twice to see it close up. See more pictures and read more about the cake here. Delia (pulling a Santa ornament from her miniature stocking. Santa is curved to one side.) "He looks like he's falling." Fiona: "My Santa looks like he's dancing." Delia: "But mine looks like he's falling. That's sort of depressing. Fiona (brightly): "Maybe he's break-dancing." 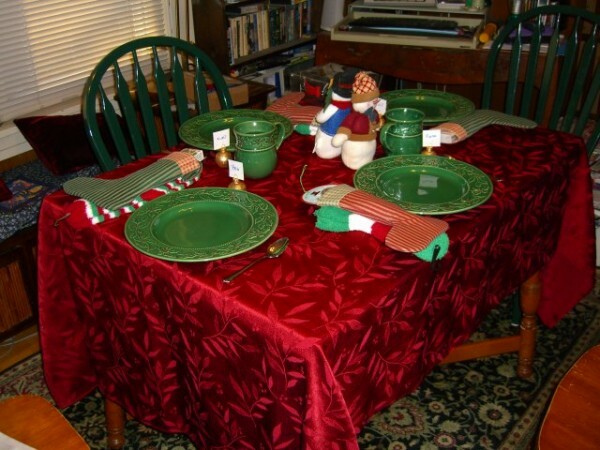 The table's set for tomorrow morning...our last Christmas hurrah. 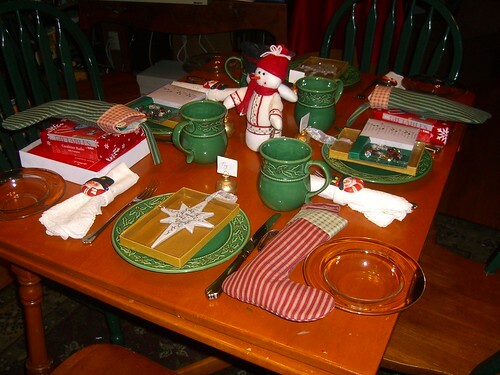 Table's set for breakfast tomorrow morning. 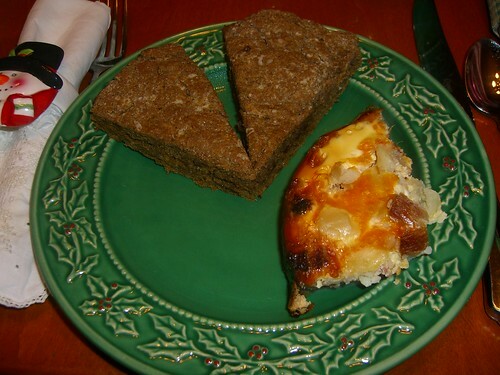 Since people asked, here is aome's recipe for Gingerbread Scones. Taken from Simply Scones: Quick and Easy Recipes for More than 70 Delicious Scones and Spreads (which I've added to my Amazon wish list). 2. Butter or Pam-spray a 10" diameter in the center of a baking sheet. With lightly floured hands, pat the dough into an 8" - diameter circle on the prepared baking sheet. With a sharp knife (helps to flour the blade), cut into 8 wedges. Bake 20-25 minutes at 375° until toothpick comes out clean. Cool at least 5 minutes on a wire rack. 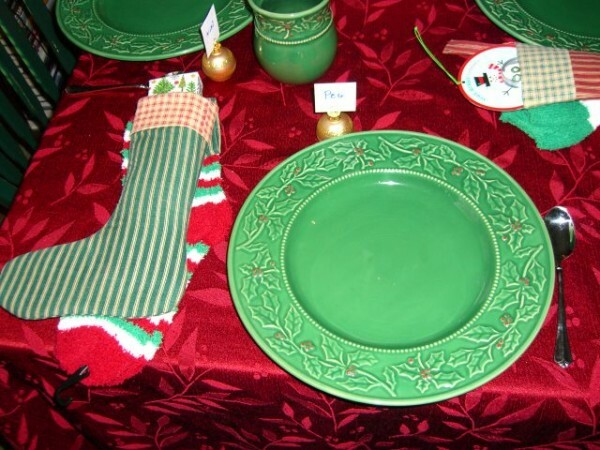 I've set the table tonight in preparation for our Twelfth Night breakfast tomorrow. I'll post more pictures then. It turns out Rob's new job will start next week; it took awhile for all the paperwork to get processed. Meanwhile he's getting stuff done around the house that he's been promising to finish for months now. I've been thinking about New Years and resolutions, as I do every year. My weight took a real jump this past month, partly due to the holidays, of course, and partly, I suspect, due to stress eating--I was really worried about the unemployment coming to an end. I'm not being too hard on myself about it, but I've decided to start tracking my calories again on SparkPeople, and upping my exercise program again, including adding the weight-lifting back in (I'd let it slide when I started biking and especially after the gall bladder surgery, and I never really picked it up again). I think I'll be able to get back down under 150 before too long. But about self-assessment in general: Kij has been talking to me the past couple of weeks about needing to take a hard look at her own life, trying to figure out what she needs to do. Something she said stuck in my mind, the need to be honest and to face the stuff you've been avoiding. I've been thinking about that this week. What about me, what have I been avoiding facing? I think the truth that I've avoided saying is that the conviction has been growing in me that I don't think I'm ever going to write a novel again. I don't know why, but the fire I used to have in me to write fiction has gone out. Kij and I talked about it this morning; I said that for so many years I thought of myself as a writer (and for me, that meant specifically a writer of published fiction). Facing this realization means facing the fact that the way I use to identify myself must change--even as I acknowledge a point that several people on my friends list have made to me repeatedly ( cakmpls I think, specifically)--that what I perhaps need to do is to quit thinking of myself in terms of what I do (I am a fiction writer, I am a karate student). It's less mind messing is just to accept myself as myself--I am Peg. There are various things I do--I wrote novels in the past, right now I'm studying karate. I may or may not do these various things in the future, but I don't need to let that cause a corresponding upheaval in my own identity. This realization feels quite sad, although I am, of course saying never say never. Maybe a great novel idea will mug me when I'm in my mid-fifties that I'll absolutely have to write. But where I am right now, I don't really see it happening. So I'm putting it out there. The most absurdly neurotic part of myself wonders if there will be a mass unfriending as a result ("Peg says she's not going to write fiction anymore??! My god, why have I have been wasting my valuable time reading her stupid blathering journal? *Defriends immediately*") But fortunately the wiser and mature part of myself realizes that this fear is neurotic; in fact it's absolutely ridiculous. If you were going to defriend my journal because I'm not producing publishable fiction, you'd have done it months ago. Heck, it's been blindingly obvious for months now that's not what this journal is about anymore anyway. So we simply continue on as we have before. I write essays here. I go to karate. I try to cook dinners my family will deign to eat. I garden. I face the dark and try to reach for the light. I make wry observations. I natter on (and on! and on!) about my extremely silly obsessions. I try to be a better person--wiser, more empathetic, more thoughtful, more politically aware. I live my life. And it's a pretty good life. I tell you about it. Or as least as much about it as Elinor Dashwood wants to share. 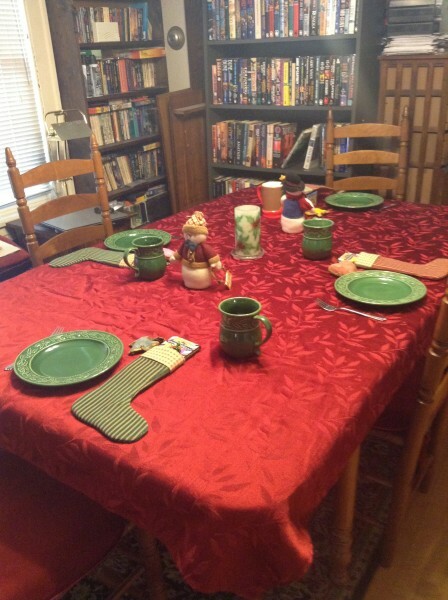 Here is our table, set for tomorrow's breakfast. I offered to make scones again, but the girls voted for coffeecake, served with cocoa, so I picked that up from the store. I think I picked some nice little things (after Christmas sales, of course!) to go in the stockings. 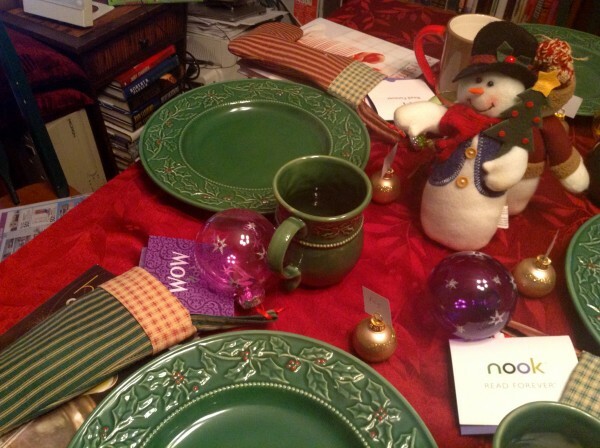 The gold-rimmed plates are from my great-grandmother, and the holly-rimmed green mugs were a gift a couple of years ago from one of my attorneys. And the napkin rings I picked up at Walgreens for 29 cents each this week. I love our Twelfth Night custom. It's just such a lovely way to bid farewell to the Christmas season. 1. Heat oven to 375 degrees F. Grease cookie sheet with shortening. In large bowl, stir together flour, 1/4 cup sugar, baking powder, baking soda and salt. With pastry blender or fork, cut in butter until mixture resembles coarse crumbs. 2. Stir in cranberries, vanilla chips, and 1 tsp. orange peel. Add yogurt and 1/3 cup buttermilk, stir just until dry ingredients are moistened. 3. Shape dough into ball; place on cookie sheet. With floured fingers, press or roll dough into 8-inch round. Cut into 8 wedges, do not separate. 4. Brush dough with 1 to 2 TB buttermilk, in small bowl, mix 1 TB sugar with 1/2 tsp. orange peel. 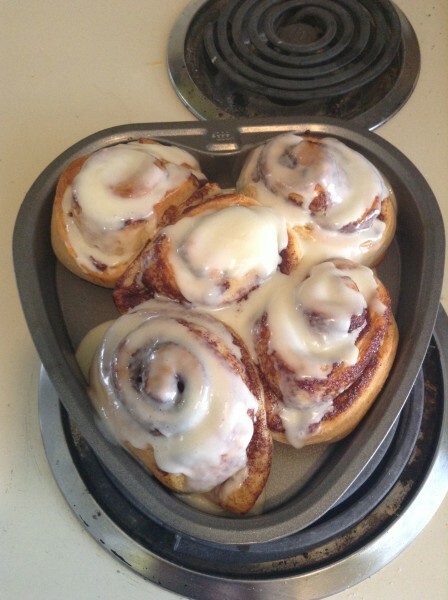 Sprinkle over dough. 5. Bake 15 to 20 minutes, or until edges are light golden brown. Immediately remove from cookie sheet, place on serving tray. Cool 5 minutes. Cut into wedges. Serve warm. [Note: you can prepare scones up to the point of adding the liquids the night before you bake them; cover and refrigerate. The next morning, stir in the yogurt and buttermilk, shape and bake. The girls had fun tonight decorating a gingerbread house with icing and candies. It turned out better than I was afraid it would--the gingerbread walls came pre-made, but several were broken, and we had to patch them together with icing. 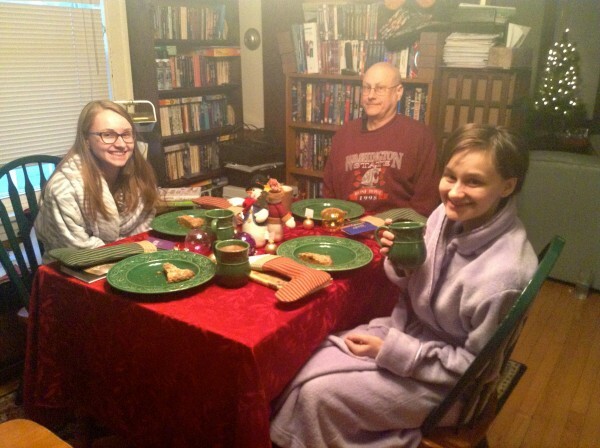 We had wanted to do our usual Twelfth Night celebration tomorrow night, but it's a bad night: the girls and I have karate, and Rob's not even coming home for dinner, so I had a brainstorm: why not have a Twelfth night breakfast? Hey, why not? I've whipped together a fancy scone batter: I'll just add the wet ingredients and bake them in the morning, and we'll have fresh hot cranberry chocolate chip scones. And I'll brew hot cocoa. 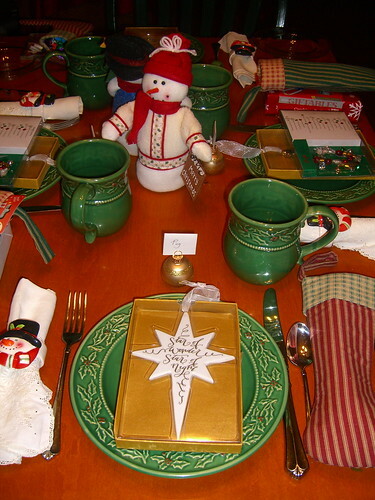 The table is set with some Christmas dishes, with the gingerbread house as a centerpiece, and there's a miniature stocking at each place with gifts. I went a tad bit over my usual Twelfth night budget, but oh well. I included a couple of books for each girl, a DVD movie each for Rob and me, and chocolates and silly plastic toys. (I put an Elastigirl keychain in mine.) 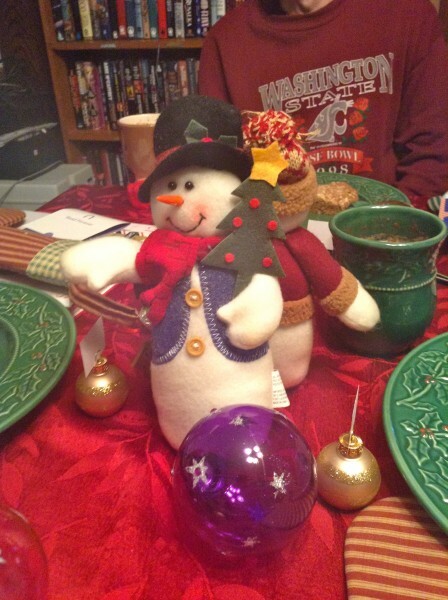 The table looks very festive. So we'll have a cozy, celebratory breakfast in the morning. A last Christmas hurrah, before we face the long cold slog of bitter January. 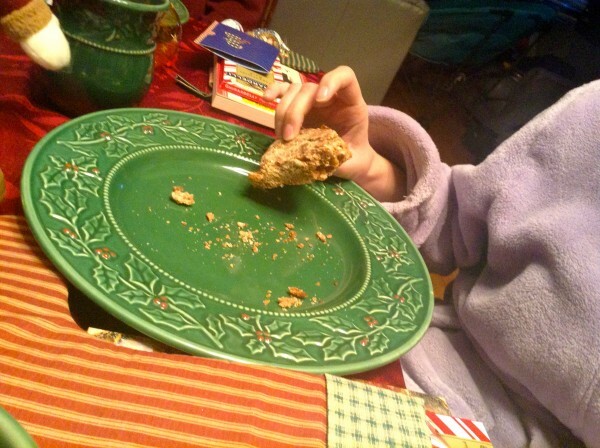 Edited to add: Fiona asked, "Do the scones have to have cranberries in them?" I looked her straight in the eye and told her, "Yes, they do." Yep. Sometimes they really don't deserve me. I was browsing in the Christmas store, everything on sale 75% off and found, to my delight, miniature Christmas stockings. I have been looking for miniature stockings for a while, because I want to use them for Twelfth Night. I bought them and put my plan into effect. The idea is, on Twelfth Night, we have one last mini-Christmas fling. I make a nice dinner (and we used the occasion to use for the first time that gold-edged china I just got from my sister that originally belonged to my great-grandmother). 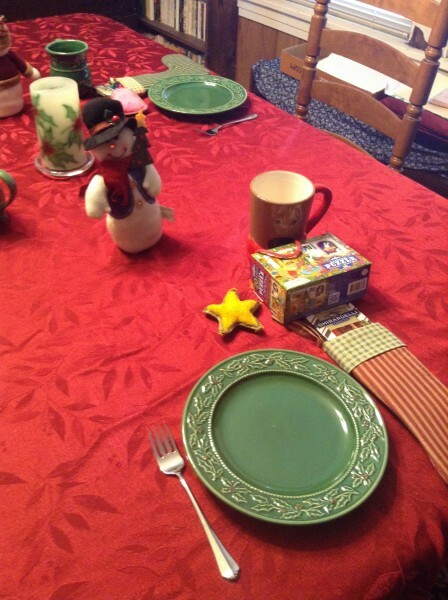 By each place setting, I put the miniature stocking, filled with last minute Christmas sale stuff: candies, post-it notes, chocolates, a couple little toys for the girls. Everything under $20, total. On Christmas Eve, Santa fills the stocking, I told the girls. Twelfth Night, we fill it for each other. Of course, I was a day late. This was really epiphany, not Twelfth Night. Never mind. We'll do it on the correct day next year. And it was fun. One last mini celebration. Yawn. Up late, for a board meeting for HP Education Fanon, the group that is running hp_orlando. Will be nodding off tomorrow at work.